His previous film The Lobster was a bizarre little film that set itself up to say something interesting, but its dry directorial style often detracted from whatever the hell it was trying to actually do – but for his newest film The Killing of a Sacred Deer, director Yorgos Lanthimos’ intentions are a little clearer; it’s still strange in its direction, but the dryness actually manages to help elevate the strangeness to something a bit more chilling and effective, making it a fascinatingly odd hybrid of Stanley Kubrick-style filmmaking and M. Night Shyamalan delivery (but more in the sense of something like The Sixth Sense than, say, The Happening). Lanthimos bases his film very loosely on the Greek myth of Iphigenia, a young woman who was offered as a sacrifice by her father after he upsets a powerful goddess. However, <adopts West Country accent> in this here film there be no such thing as that <back to normal>; successful neurosurgeon Steven (Colin Farrell) lives an idyllic existence with his wife Anna (Nicole Kidman) and their two kids Kim (Raffey Cassidy) and Bob (Sunny Suljic), but every so often meets up with teenager Martin (Barry Keoghan), a former patient of his and whose father had died some years ago, and acts as a sort of mentor figure to him. Martin soon reveals some rather sinister intentions as he gets closer to the family, and when both Kim and Bob suddenly succumb to a mysterious illness that renders them immobile and with a loss of appetite; it turns out that Martin blames Steven for his father’s death, since he died on his operating table, and in return he forces Steven to even the score by choosing which of his children he must kill so that the other can be well again. Once again, Lanthimos has created a very strange world with this film, although it’s significantly more grounded in reality than The Lobster, at least in comparison. Here is a world where everybody seems to speak in the one monotone voice almost the whole time, where emotions do exist but are used very sparingly, and where people speak in the most blunt manner about the most unorthodox things, like casually mentioning how Steven’s teenage daughter has just started menstruating, or asking to show off or compare body hair right on the spot. It’s weird, because it feels like an alien made this movie, but at the same time this alien is somewhat domesticated on our blue planet and has some understanding of what makes people tick. Lanthimos, just going off this film and The Lobster (I honestly have yet to see Dogtooth or any of his other films), seemingly likes to create vast and surreal stories and then tell them in such a dry and monotonous manner that would make Wes Anderson scream for them to be less quirky, although out of those two this is easily the stronger product, because it at least uses its strange set-up and equally weird delivery to make itself feel like a movie that could actually have lasting power, as opposed to The Lobster which just frustrates with its completely off-putting manner and doesn’t lend itself to repeat viewings. Then again, The Killing of a Sacred Deer isn’t the kind of film that people would want to revisit either, but for entirely different reasons. It is a profoundly disturbing story, almost like a modern representation of one of the darker Grimm fairy tales let alone actual Greek mythology, and the depths that this seemingly idyllic family will stoop to in order to make everything right again are horrific and often effectively creepy. Helping enormously is the fantastic cinematography by Thimios Bakatakis, whose shots of people just walking down hallways or cars driving along a road instantly remind one of Stanley Kubrick’s style of filmmaking on movies like The Shining or A Clockwork Orange, and they help illustrate a surreal and uncomfortable visual portrayal of the strange alternative universe we seem to be witnessing, making it an atmosphere that doesn’t necessarily need vast camera movements to be chilling. In addition, for all that I’ve said about Lanthimos’ idiosyncratic directorial style, he does know how to make a situation feel far more tense and suspenseful than it probably is, thanks to the inclusion of a chilling score and some excellently understated performances from the cast, particularly Farrell who in scenes that actually allow him to express a bit of emotion manages to be really effective. This feels like Lanthimos’ attempt at making a lost Stanley Kubrick film, and in terms of his visual style he’s very nearly there, although his style is once again bound to be divisive enough to prevent him from actually making something universally beloved like any of Kubrick’s films. As someone who didn’t exactly warm to The Lobster like I know a lot of other critics did, I found myself intrigued by The Killing of a Sacred Deer because it actually felt like he had made a film where the flat deliveries and blunt dialogue actually compliments the disturbing nature of the story, rather than severely detract from it. It’s hard to say that this is a film for everyone, because the honest truth is that it isn’t; it’s easy to see people having similar reactions to this than they did with The Lobster, and end up overall dismissing it because it didn’t connect with them emotionally because it is so dry and monosyllabic. However, if you’re at the very least willing to give it a chance, then it’s likely that you’ll walk away from this feeling not necessarily glad that you saw it (because, again, it contains material that’s pretty hard to stomach), but appreciative that you were able to spend a couple of hours in a world that’s certainly removed from reality, and fascinatingly so, even if you can’t figure out what exactly is the thinking behind all of it. 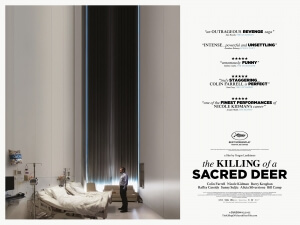 The Killing of a Sacred Deer is another strange and bizarre film from Yorgos Lanthimos, although unlike his previous film The Lobster the monotone delivery from his actors and the almost-alien directorial style actually help tell this much more disturbing story in the most effective and profound way that it can, making it a fascinatingly uncomfortable viewing.